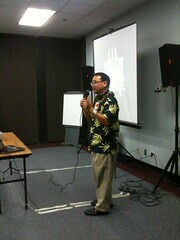 In a recent Innovation Speaker Series talk at HMSA, Ian Kitajima from Oceanit described innovation at his company. He showed this slide that summarized their company’s approach to innovation. The slide consisted of 4 concentric circles: Pain, People, Capital and Letting Go. The first circle begs the question, what pain are you trying to alleviate, what problem are you trying to solve? This begins the innovation process. Next is people. People are the talent pool to solve the problem. As any commercial enterprise will confirm, capital will determine priority. How much will this innovation make, how much will it save and/or how much will it cost? Finally, Letting Go was the outer circle. This was the aspect of being able to watch without attachment, your idea or project move into the hands of implementors or perhaps get spun off into another business. As a technology company Oceanit was able to use this philosophy to go beyond their original line of business in ocean engineering. They’ve expanded their span of expertise to include nanotechnology, medical sensors, sniper fire detection, biotechnology and others. As a company they continue to look at solving the biggest problems (Pain) by not limiting themselves to preconceived notions of what they can or cannot do (Letting Go). As a relatively small technology company (by Mainland terms), built from the ground up, this might work for Oceanit. But what if you work for an organization that is much bigger, steeped in tradition and where innovation is not a systemic part of the overall culture. This is where the fractal nature of innovation applies. Innovation as a cultural characteristic starts with each person and before it can become systemic it has to grow from one person to two, two to four, four to eight and so on. From a macroscopic view Oceanit exhibits the characteristics of innovation but as you look more closely, there exists cells of innovation. A large organization looking to innovation as a way to meet new challenges cannot expect to see systemic adoption of innovation occur immediately. This happens slowly in those small cells, by individuals who are challenged with a problem, who go against the norm and venture to think differently. How quickly this takes hold throughout the organization will depend on the environment. It is much harder as management to tell someone to innovate and expect results than to recognize innovation and nurture it. But the former is still better than if management were to stifle the seed of innovation all together. Like a fractal that is governed by a formula and a set of parameters, the formula for innovation to take hold will depend on the individual’s initiative and the supportive environment. Together great things can occur.